"Getting Organized" is one of the top 10 New Year's resolutions every year. Which I think is great. 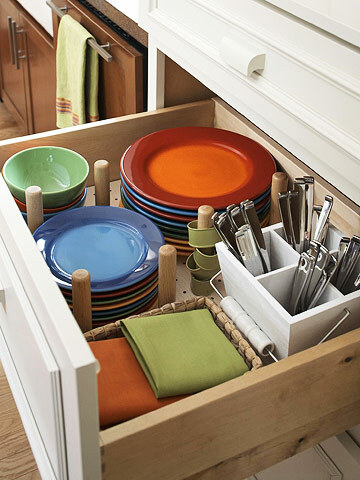 Getting organized is a very achievable goal and will have a positive impact on your day-to-day living. If you're one of the many who hope to achieve this this year, here is a tip to help you do it. Pegboard. One of my newest favorite ways to achieve organization is by using pegboard. Here are a few of my favorite ways to incorporate it into your home. 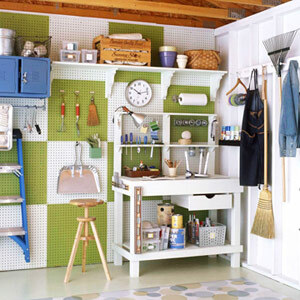 I used to think of pegboard as bland and boring, but look how a little paint can completely transform it. I foresee this cheerful design in my future garage. You don't have to outfit a whole wall to be able to use it. 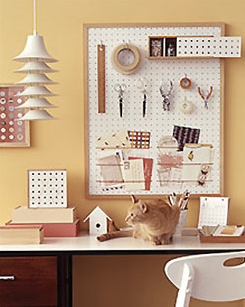 Even a small framed piece of pegboard will help bring organization to a desk space. I especially love the twine strung across the bottom to hold pieces of paper. Big drawers are a wonderful thing. But they can be even better when they're used to their full capacity. Enter pegboard. Use pegboard and pegs to map out areas for your dishes and keep them in place. By doing so you'll be able store far more than you used to.